The Gabii Project is an international archaeological project, directed by Nicola Terrenato of the University of Michigan. The Gabii Project began in 2007, seeking to study the ancient Latin city of Gabii through excavation and survey. Gabii, located in central Italy, was a neighbor of and rival to Rome, and flourished during in the first millennium BC. The excavations at Gabii are uncovering extensive and complex remains within the city’s urban core. Convergent photogrammetry is essential to the project’s recording strategy. At Gabii, this technique is used to document features with complex geometries or large numbers of inclusions, including walls, pavements, rubble collapse, and architectural elements. These types of features can be quite time-consuming to document thoroughly by hand or using conventional surveying in the field. 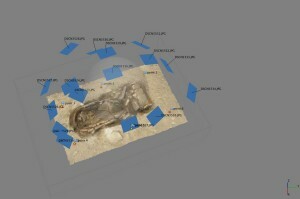 The 3D models collected in the field are georeferenced. They are subsequently simplified for incorporation into the project’s GIS, and compiled into models for distribution online using Unity3D. You can see a sample model in the Unity3D interface here. You will need to download and install the free Unity webplayer to view the model. Please cite this document as: Opitz, Rachel. 2013. Gabii Photogrammetry.CAST Technical Publications Series. Number 11943. http://gmv.cast.uark.edu/region-data/data-photogrammetry/gabii-photogrammetry/. [Date accessed: 22 April 2019]. [Last Updated: 22 March 2018]. Disclaimer: All logos and trademarks remain the property of their respective owners.